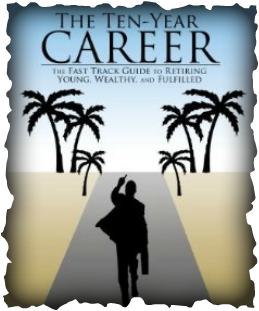 About the Book - The Ten Year Career"The Fast Track Guide to Retiring Young, Wealthy, and Fulfilled"
"This is a super book, loaded with great ideas for success that everyone can learn and apply, in any business, at any age!" · Why you must plan for the success you want and how to do it. · Harnessing the power of your mind and how to condition yourself to get what you want. · The importance of goals, how to set them, and then plan to reach them. ***Also included are the different stages of wealth, what to do to reach each stage, and types of investments for each stage. · Time management and the daily activities that you can put in place to get exponentially more accomplished in less time. · Learning to sell, why it is important, and some basic fundamentals of great salespeople that you can use to your advantage. · The success and wealth traits of the most successful and examples of each. · 10 critical concepts that someone must master and how to utlize them. · The importance of becoming a lifelong learner, and for each section of the book, the recommended works to further one’s knowledge. · Taking action and ways to begin to acquire wealth and income in different areas, from using your talent, to investing, and buiding a business on the internet. · Lastly…why you must give back. ***Thousands of dollars of FREE bonus material including videos with top mentors, trainings, FREE items, and much more will provided online through the website to help you with your Ten Year Career Journey.